Today I wore a maxidress to try to minimize sweatiness. Ironic? Anyway, both roommates complimented the dress, & I was quite happy about it. Unfortunately, the thigh rub that comes with summer dress-wearing did not make for sustained happiness. I also saw "Inception" for a second time, & for the second time, I fell asleep. Ironic? Anyway, I didn't fall asleep during the same parts as last time (or spill anything caramelized in my purse), so it all came together quite well. Unfortunately, the temperature inside the theater was approximately 85 degrees, which didn't feel like such a break from the outdoor heat. And I went to Sticky Rice for brunch with the roommates. Nothing ironic or unfortunate there, just delicious. And while it didn't do much to cool me down, it sure did fill me up. Tater tots for breakfast? Well, OK. Seriously, it's too hot to go outside, even - especially? - to socialize. It's too hot to move. It's too hot to booze, except inside, but we don't have anything in the house. And we'd run out & get some except, you know, it's too hot to go outside. Don't mind me. I'll just be sitting here in my pajamas, watching "Men in Black," & oh yeah, sweating. Snowpocalypse, I miss you. I'm with you on this one. I saw Inception last night, too- I didn't fall asleep, but it was also ridiculously hot in the theater! This heat is just gross and I hate it. Even Buster is depressed and sluggish. Summer time is the only time I miss Ohio! Yeah, the heat is unbearable. I managed to stay inside all day reading "The Girl the the Dragon Tattoo," which was luckily so awesome I finished it all in one day. I can't wait for fall. You fell asleep?!?!? Haha I had to pee the whole time, maybe that's why I didn't fall asleep. How did you fall asleep? I really liked that movie! Ha! Haha, you fell asleep! I wondered if anyone would actually do that. I love summer but yeah, when it's too hot it makes me want to scream. Actually, I often do scream and break down...in streets...in front of people, unsympathetic people. How funny - your rants about the heat sound like my rants about the cold. 101 degrees at 9am sounds like Florida's hurricane season after we've been given a good whop of Cat 3 and the power's been out for 2 days. We can handle that, no problem. Come winter when the Nor'easters blow with 30-40 degree winds, we're total sissies hunkering down like it's the end of the world. Because IT IS!! Gah...love me some 90 degrees. I don't get how people prefer heat over cooler weather. I was a huge fan of it snowing in March this year and last year. What's even worse is I'm going to Cozumel in a few days, and there will be no escape from the heat's grasp. How come there isn't a heat equivalent to Jack Frost? John Melt? Damien Sauna? CitySports carries a deodrant-stick looking thing called Body Glide. I get the thigh-sticky-thing when I walk long distances, so it's been the main reason I've been able to go on my long walks. Basically, just apply it to areas likely to stick, and it acts as a lubricant and prevents stickiness and rubbing and the accompanying rashes. It's great. $10 per stick, I think, and usually lasts a few months. Haha I never thought I would miss the Snowpocalyspse! I've been camped out in my living room by the AC vent all weekend. I too fell asleep watching Inception. For the better part of an hour. Good to know I'm not the only one. Falling asleep during Inception twice is better staying away through Salt once. I refused to go outside on Saturday since it was like 110 here. It's ridiculous and you know it's bad when 93 actually feels sort of cool. 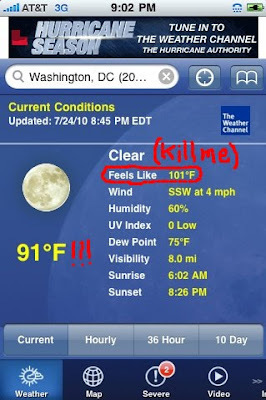 I know you think I am crazy but I miss the DC heat. Palm Springs is hotter. 111. But I miss the balmy heat of DC. I hope you find a way to cool off. I fell asleep in Inception as well...I think it was because they kept talking about SLEEPING/DREAMING and before I knew it I was out cold. Thigh rubbing/sweat is the the WORST.